Did you know there are Walgreens locations where you can safely dispose of your unused over-the-counter and prescription medications year-round? Walgreens, Blue Cross and Blue Shield of Alabama and the Medical Association of the State of Alabama are partnering for an unprecedented campaign to Take Back Alabama! 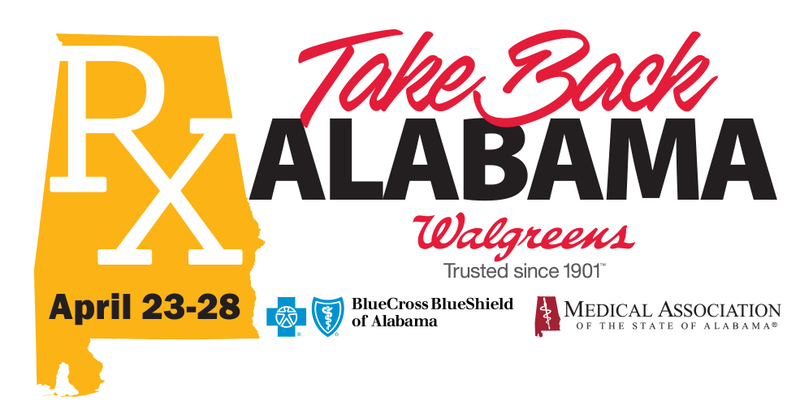 The Medical Association would like to thank our partners, Blue Cross and Blue Shield of Alabama and Walgreens, for their participation in Take Back Alabama. UPDATE APRIL 23, 2018: The Medical Association’s Take Back Alabama Week kicked off this week with a press conference at Walgreens in Birmingham on Monday, April 23. Representatives from AmerisourceBergen, Blue Cross and Blue Shield of Alabama, Pfizer, Prime Therapeutics and Walgreens joined Attorney General Steve Marshall and Birmingham physician Gregory Ayers to announce the installation of 13 new safe medication disposal kiosks in select Walgreens locations in Alabama.